If your company doesn’t have a formal job orientation program to onboard new hires, create one. Now. 1. Invest in an automated employee onboarding software. The onboarding software should be dedicated to the end-to-end talent acquisition lifecycle, allowing recruiters and hiring managers to quickly and easily manage tasks, keep everyone on track with task reminders and deadlines, and measure new hire activity, internal processes and employee turnover. It also allows you to extend a personal welcome and helps you save time and improve management of electronic files to eliminate paperwork. 2. Start the onboarding process before day one. The faster a new hire feels welcome and prepared for their new job, the faster that employee will be able to contribute to the company’s overall success. Rather than spending hours filling out paperwork on their first day, it is wise to push all necessary documents and forms, such as I-9 and E-Verify, out to the new hire through the company onboarding portal prior to their start date, enabling them to be more prepared and engaged when they finally begin their new role. 3. Create a program for all new employees. General company-wide policies and procedures, including appropriate dress code, parking details, etc. Information about benefits, including healthcare, 401k, etc. 4. Personalize the training program. Roles across various departments require different levels of training. To ensure your new hire feels 100 percent comfortable in their new role and ready to contribute, their manager should have materials ready for them including process documents, their specific goals and how they fit into the overarching company strategy, a customized learning plan and objectives, and meetings with important-to-know people, such as their mentor and fellow team members. 5. Keep it fun and relevant. 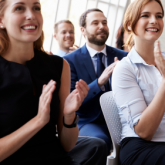 Although onboarding is a very important component of an organization, keeping it fun and engaging will help to ensure that the information is retained and that employees are excited about their new role. New hire breakfasts or socials, scavenger hunts, and group exercises can help break the ice, contribute to a positive onboarding experience, and aid in the assimilation process. But ensure that your teambuilding activities are relevant and reflect the culture that your company promotes. Be clear in your new hire’s goals and objectives, and set milestones and check-ins to confirm that they are on the right track and receiving the resources and training they need to be successful. As a result of creating or updating your new hire orientation and onboarding program, you will notice greater new hire engagement, enhanced HR productivity, better retention rates, improved task management, and saved time and money.